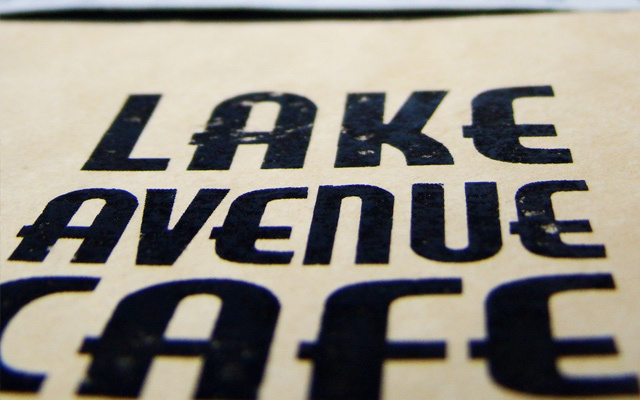 Lake Avenue Café has been located in the heart of Canal Park in Duluth, Minnesota, for close to 20 years, but in 2008 a breath of fresh air shook the place up in the guise of new owners. What was once a staid café has been reborn as a hip dining destination for both the younger Duluth as well as discerning travelers. Local artists’ work dons the walls. They invite members of Duluth’s vibrant musical community to perform in the restaurant and occasionally in the parking lot outside. On a recent night, Haley Bonar, local love and rising musician of note, belted out some tunes with her side project Gramma’s Boyfriend and lit the place of fire (figuratively speaking, of course). However, the most noticeable change has been in the quality of food and drinks available in the breezy space, just steps from the majestic big lake. The new owners, Derek Snyder, Mark Swenson and Michael Schraepfer, are a collection of self-confessed booze snobs. Behind the bar, you’ll find nothing but top shelf available. There is no Popov vodka–there isn’t even a pedestrian bottle of Bacardi rum. Many of their spirits are from micro-distilleries including a Texas whiskey made from blue corn, sweetened with local figs and honey; a tree-sap liquor; or a beet and thyme-infused gin served with cucumber liquor and soda water. Crafting classic cocktails with the finest ingredients, they serve elegant appertif or digestive elixirs with a rich, succulent meal. The beer and wine lists are carefully selected as well including luscious, spritely, and utterly affordable wines and beer from local breweries. The bar area is warm and cozy in the cooler months. I spent an evening at the height of the November gales, huge waves walloped the shore, and rain assaulted the brick exterior – the kind of weather that took the Edmund Fitzgerald, the lake’s most famous shipwreck. Meanwhile, I was nestled inside, sipping a supple Malbec and feasting on spicy chorizo wrapped in fatty bacon, cozy as a fireside pig in a blanket. While we’re talking food, let me tell you, I don’t use the word “luxurious” lightly, plates include opulent marrow toast ($12), creamy lobster pasta ($19)–even the mac and cheese ($12) is studded with a bar-raising, pungent Taleggio. Simply put, these kids aren’t kidding. They don’t do average, down to the rough-hewn wood tables and banquettes, made by an artisan friend. They serve food from brunch until midnight and cocktails until 1:00am. When the weather is kinder, one couldn’t ask for a better seat than lounging on the afternoon sun-soaked deck. Tucked away from the hustle and bustle, even on busy nights, it feels like an oasis. For the upcoming Duluth Pride celebration, owner Derek Snyder says they hope to have the Roller Dames, Duluth’s roller derby team do a demo in their parking lot with local celebrities serving as referees. There will also be live music. A shining star added to the Superior Street’s main drag in 2009, the Zeitgeist Arts is a café, independent cinema, and theater space. Created with grant money, they offer contemporary artists a place to feed their souls and nourish the body. Screening independent cinema, tickets are only $8.00, in addition to being the only spot for such movies (since the shuttering of the lamented NorShor).